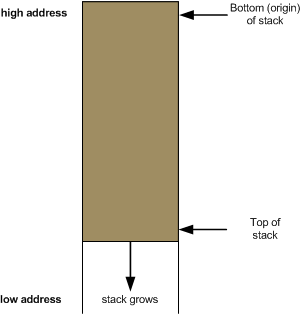 I've noticed more than once that some programmers are confused about the direction in which the stack grows on x86, and what "top of the stack" and "bottom of the stack" mean. It appears that this confusion is caused by a basic mismatch in the way people are used to thinking about stacks, and in the way the stack on x86 actually behaves . In this article, I intend to resolve this confusion with a few helpful diagrams. Back to the basics. The stack analogy is sometimes demonstrated to new students of computing with a stack of plates. 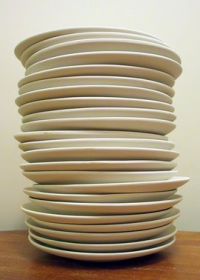 You push a plate onto the stack and pop a plate off the stack. The top of the stack is where your next plate goes when pushing, and from where you take a plate when popping. In computers, the stack is usually a specially treated region of memory. In the abstract sense, the analogy applies - you push data by placing it on the top of the stack, and pop data by taking it from the top of the stack. Note that this doesn't address the issue of where the top of the stack is located in memory. So when we say "top of the stack" on x86, we actually mean the lowest address in the memory area occupied by the stack. This may be unnatural for some people . As long as we keep the diagram shown above firmly in mind, however, we should be OK. 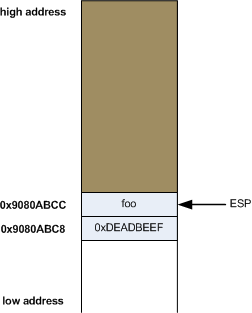 While we're at it, let's see how some common idioms of x86 assembly programming map to this graphical representation. 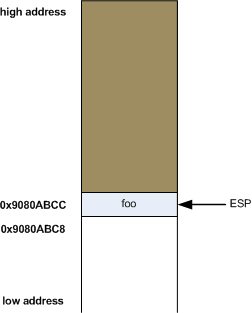 In this diagram, address 0x9080ABCC is the top of the stack. The word located in it is some "foo" and ESP contains the address 0x9080ABCC - in other words, points to it. And the value 0xDEADBEEF will be written into eax. 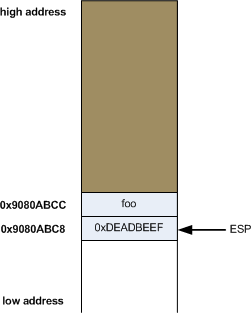 Note that 0xDEADBEEF also stays at address 0x9080ABC8, since we did nothing to overwrite it yet. When looking at assembly code generated from C, you will find a lot of interesting patterns. Perhaps the most recognizable pattern is the way parameters are passed into functions using the stack, and the way local variables are allocated on the stack . The green data were pushed onto the stack by the calling function, and the blue ones by foobar itself. 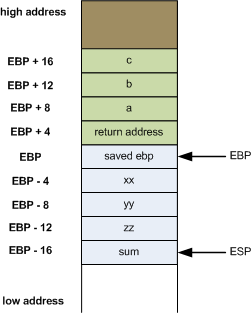 Since esp keeps moving as the function executes, ebp (base pointer, also known as frame pointer in other architectures) is used as a convenient anchor relatively to which all function arguments and locals can be found. Arguments are above ebp in the stack (hence the positive offset when accessing them), while locals are below ebp in the stack. It doesn't help that some online resources mistakenly call the top of the stack "bottom". The version presented here is the correct one of x86, since it relies on terminology defined in Intel's x86 architecture manuals. You may try to fix the confusion by viewing memory with its low addresses at the top and high addresses at the bottom. While this would indeed make stack movement more natural, it would also mean that increasing some memory address would take it down in the graphical representation, which is probably even more counter-intuitive. There are several instructions x86 defines in the "push family". I'm demonstrating push since it's the simplest and most generally applicable. This only applies to some calling conventions and architectures, of course. In others, some parameters are passed in registers.